How would a slowing economy test China’s top corporations? Terry Chan, head of corporate research at Standard & Poor’s, presents the results of a recent study of Chinese companies. With China’s economic slowdown in 2012, the business environment for Chinese companies has become less favourable and has put pressure on their financial risk profiles. There is a wide divergence among top companies from different industry sectors in terms of how well they can weather the economic slowdown. Terry Chan, head of corporate research at Standard & Poor’s, shares key findings from a recent study of China’s leading corporations. How is China’s slowing economy affecting the business environment in the country? The operating environment for companies in China has become less favourable due to the economic slowdown in 2012. In fact, the National Bureau of Statistics (China) surveys show that the manufacturing purchasing manager index (PMI) fell below 50 in August and September 2012, although there was a marginal recovery in October 2012. This implies negative business sentiment. On the other hand, the non-manufacturing PMI is more than 50, signalling a positive business sentiment. This perhaps reflects a more resilient retail sector, with the Chinese government encouraging domestic consumption. Since early 2012, Standard & Poor’s has maintained that China is likely to be able to manage a soft landing. We continue to expect China’s real GDP growth to fall to 7.5% in 2012, compared with an average growth of 9.6% for the past three years. What are your overall conclusions about the credit strength of China’s top corporations? These findings are not surprising. To keep pace or outperform China’s fast-growing economy, major Chinese companies have had to make substantial investments. The fact that state-owned-enterprises (SOEs) represent a significant proportion (about 80%) of our survey partly explains this push. The objectives of SOEs go well beyond profit maximisation. Their shareholder base and relative cost of capital favour the use of debt, a preference that naturally colours their financial results. The SOEs therefore have relatively high leverage and weak profitability. However, they also have fair-to-strong business positions to support their credit profiles because of legacy and continuing government support. How are different sectors weathering the economic slowdown? 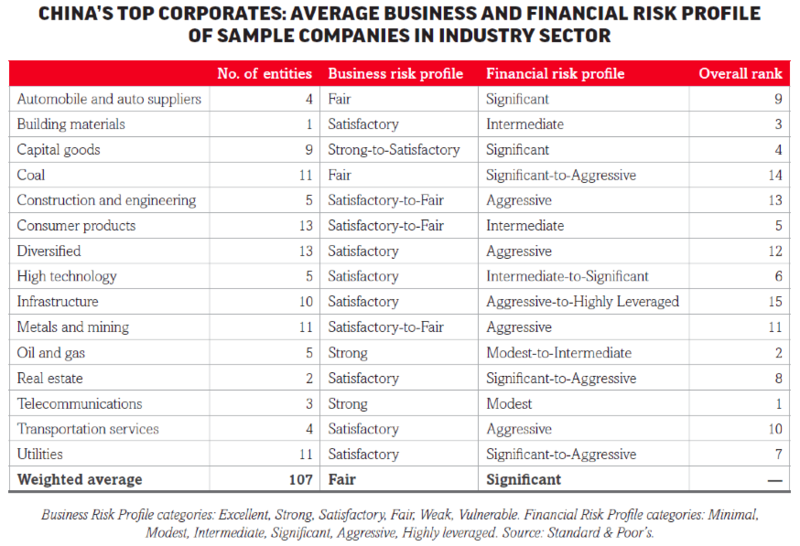 There is a wide divergence in business and financial risk profiles, between and within sectors. Among the 15 sectors covered in the study, the top companies in the telecommunications and oil and gas sectors rank the best in terms of credit strength, with strong competitive positions and minimal financial risks. In contrast, those in construction and engineering, coal and infrastructure are more aggressive. In metals and mining, the major players have a fair business profile, although steel and aluminium face severe trading conditions. What are the key trends in earnings performance and debt position? We find that profitability of the top Chinese companies, as indicated by the weighted average Ebitda margin of the sectors, actually declined from 2009 to 2011. Nearly all sectors recorded lower profitability in 2011 compared with 2010, as the economy started to slow in the second half of 2011. Given continued economic deterioration in 2012, we believe profitability has likely fallen further. While operating cash flow against debt, as measured by the weighted average funds from operations-to-debt, improved in 2010 from 2009, it slid back in 2011. Lastly, our study shows debt coverage, as measured by the weighted average debt/Ebitda, was roughly stable from 2009 to 2011 inclusive. What’s your outlook for China’s real estate sector? Despite some improvement since early this year from strengthening liquidity and higher sales volumes, our outlook for the Chinese real estate sector remains negative. However, it has turned less negative than it was six to 12 months earlier. A weakening economy reduces the government’s incentive to further tighten the screws on the property sector, a major pillar of the economy. Moreover, some of the government’s likely increase in spending to stimulate the flagging economy could spill over to the sector. We expect the government to adopt a differentiated policy for China’s real estate sector. On one hand, it will seek to encourage demand and supply to satisfy end-user buyers. On the other, it will continue to control or curb investment and speculative demand. We believe purchase restrictions are likely to remain during the next 12 months. They will be phased out when the government implements more efficient measures — such as a property tax — to curb investment demand or it expands investment avenues for the public. In addition, we believe industry consolidation and polarisation will continue in China’s real estate sector for the next 12 months. Large and stronger players are likely to gain ground, while small and weak players are likely to struggle to stay afloat. Why is the infrastructure sector positioned last among the 15 sectors in your study? Our sample for this sector consists of 10 entities. Infrastructure companies’ requirements for high capital expenditures has pushed their debt-related ratios to close to the bottom in our study. Nevertheless, we note that the Ebitda margin for the sector ranks third among the 15 sectors. Chinese local regional governments (LRGs) have announced significant investments in infrastructure projects in various sectors: power, water and transport infrastructure. This massive infrastructure task will create a wide funding gap, which could stretch beyond LRGs’ funding capability. Under the government’s 12th five-year-plan (2011 to 2015), the overall costs on railway and airport projects would be about Chinese Rmb4.3 trillion ($685 billion). Can you explain why steel and aluminium are facing tough times? Large Chinese steel companies are losing money this year, for the first time in 10 years, even though steel production is still at a record high. Overcapacity, lack of product differentiation, market fragmentation, and slowing demand will likely keep steel prices soft and could easily depress them further. We expect weak margins to erode the profitability of China’s steel sector over the next couple of years. We also believe the sector’s lack of production discipline (ie, the shutting down of capacity to meet reduced demand) weighs on the prices of crude steel. The government has implemented several plans and policies that have called for industry consolidation, technological upgrades and closures of polluting and inefficient plants. Despite some progress, overcapacity continues to plague the industry since 2005. While reliable estimates of overcapacity are difficult to obtain, we estimate the level to be about 10% to 25%. We believe these structural issues will continue unless the government implements new radical policy measures toward industry consolidation. For more information or to obtain complimentary copies of Standard & Poor’s publications: China’s Top 100 Corporates and China’s Top 50 Banks, please click here.